Michael Dunlop on the Tyco BMW Superbike during qualifying at the Isle of Man TT in 2018. Michael Dunlop has pledged to return ‘fitter and faster than ever’ as the Ulster road racing star continues his preparations for the new season. Dunlop will again ride for Northern Ireland’s Tyco BMW team in the Superbike class on the new S1000RR machine and is running his own Superstock and Supersport machines under his MD Racing banner. Ballymoney man Michael Dunlop with Tyco BMW team owners Philip and Hector Neill after he won the Superbike TT in 2018. 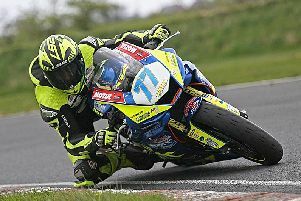 His future had been in doubt after the tragic events of 2018 but the Ballymoney rider says racing is simply in the blood for the Dunlop family after confirming recently that he would keep racing this year. “We’ve had our fair share at this game and the Dunlop name has always been big into motorbikes,” said Dunlop, who attended the Coleraine and Dublin launches of the 90h anniversary North West 200 on Thursday and Friday. Dunlop upped his haul of Isle of Man TT wins to 18 last year, making him the third most successful rider ever at the event. He is set to commence testing in Spain this week and hopes to ride the all-new BMW S1000RR Superbike soon.